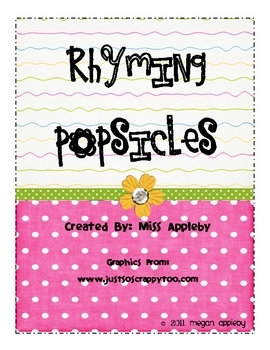 Rhyming Popsicles contains 16 popsicles and 1 follow-up activity. The popsicles should be cut along the brown and pink line so students can easily match the two parts. Once this is done, there will be 32 popsicle pieces. Some rhyming examples are: red/bed, hand/band, & dog/frog Not all of the rhyming popsicles have to be used at once. 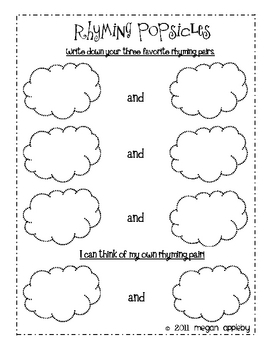 On the follow-up sheet, students will choose their three favorite rhyming popsicles to write, followed by their own rhyming pair.